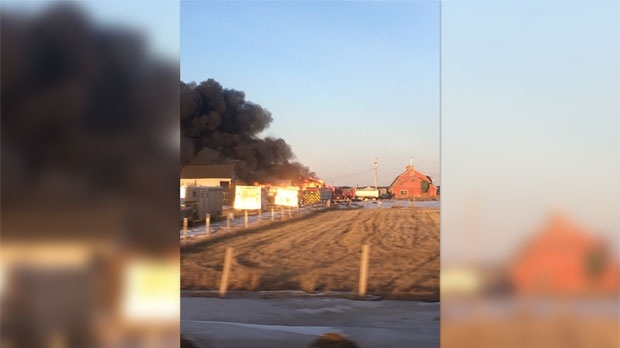 A Wednesday evening fire in a rural area north of Cochrane destroyed a building and its contents and sent a plume of dark smoke into the sky. Members of the Rocky View County Fire Department responded to a property near the intersection of Highway 22 and Highway 567 at approximately 8:00 p.m. after the owner called 911. The fire was extinguished but a Quonset, and the fire equipment and a vehicle inside, sustained extensive damage. The cause of the fire has not been confirmed. Fire crews remained on the scene into the early morning to ensure hotspots did not reignite.